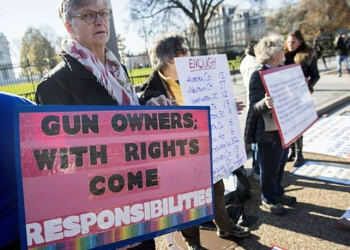 Protesters with the group "We the People for Sensible Gun Laws"
The recent tragedies in Colorado Springs and San Bernardino have prompted more calls for gun control. But what controls? And will they work? Gun-control advocates say we need universal background checks and bans on assault weapons and gun sales to those on the no-fly list. Unfortunately, these laws are not likely to stop terrorists or deranged persons determined to commit mass murder. Both Colorado and California have universal background checks, which means they require a background check on every sale -- retail or private. These checks did not stop the recent attacks. Yet President Obama, Hillary Clinton and other gun control advocates keep pushing such checks at the federal level. Quite simply - gun laws have not stopped mass shooters and never will and gun control advocates are offering a false fix. The planned end game is of course finding a way to confiscate all guns - which simply means disarming just the good guys. And, so it goes on.